Over a century ago, Walter McClintock captured rare images of Native Americans and their culture. McClintock was the son of a wealthy businessman from Pittsburgh, Pennsylvania. He developed an interest in the American West after he went there in 1895 to recover from typhoid fever. A year later, he returned to the West. This time he went as a photographer. His job was to take pictures for a federal investigation of national forests. While there, he came into contact with the Blackfoot community in northwestern Montana, and began a life-long interest in them. 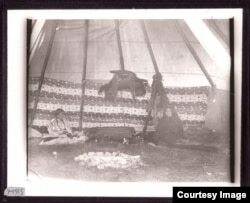 Over the next 20 years, he took several thousand photographs of the Blackfoot Indians. The name Blackfoot is thought to have come from the color of their footwear, which were painted or darkened with ash. Walter McClintock worried that the expanding American West would wipe out the Blackfoot. Fearful that their traditional culture would be lost, he recorded their way of life before it disappeared. McClintock wrote books and spoke in public about his experiences with the Blackfoot people. During the early 1800s, the Blackfoot had about 20,000 members. However, their population was reduced to fewer than 5,000 by the early 20th Century. Starvation, war, and disease brought by white settlers had killed them. Today, there are about 16,000 registered Blackfoot Indians living on the Blackfeet Reservation in northwestern Montana on the eastern side of the Rocky Mountains. 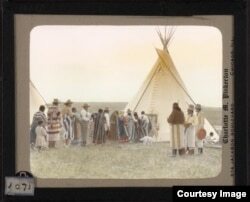 Sherry L. Smith, a writer and historian, says one of McClintock’s favorite images was of a Blackfoot lodge. The structure gives off “a warm, radiant incandescence” from within. She noted that the photographer “tried his best to enter that lodge and explain its interior life to other Americans”. 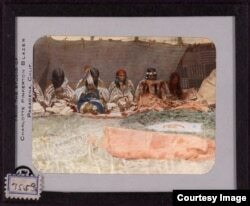 Below are some hand-colored, transparent, glass lantern slides Walter McClintock made around the year 1900. 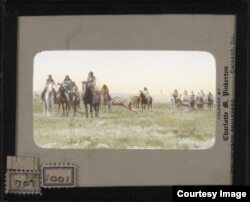 A lantern slide is a photograph on a glass slide. It is often hand-painted to look more appealing. In McClintock’s case, the pictures represent an idealized version of an endangered culture at the beginning of the modern age. Dora Mekouar reported this story for VOA. George Grow adapted her story for Learning English.